According to the just-issued United Nations climate change report, the odds that humans are causing global warming has increased to a greater than 95% certainty. Yes, they’ve looked hard at the evidence, and yes, we’re the perp. In effect, we’re de-terraforming the planet — making it less and less hospitable as a place for our species to live. I’ve been writing about climate lately for a reason (well, several). One is that we’re on the verge of seeing full new report from the IPCC (the United Nations Intergovernmental Panel on Climate Change). The report is in four volumes, three covering some aspect of climate change, and one a synthesis of the others. Volume I, from the IPCC Working Group 1, deals with the physical basis — the physical evidence that climate is changing and (conservative) predictions about how much it will continue to change under a number of scenarios. The full Volume I report is out; the rest are due in 2014. To read just the Summary for Policymakers, click here (pdf). 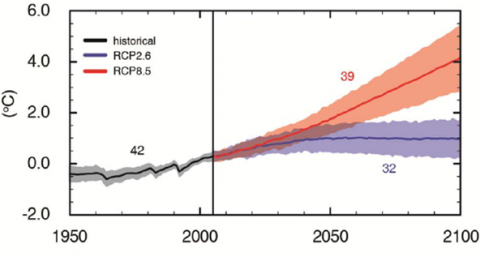 My discussion of IPCC climate scenarios from previous reports is here. The bottom line from the Volume I Summary: It has been determined that humans are now 95% certain (“extremely likely”) to be causing global warming, up from just “very likely” (>90%) as stated in the previous report (AR4). It is now considered even more certain (> 95%) that human influence has been the dominant cause of the observed warming since the mid-20th century. Natural internal variability and natural external forcings (eg the sun) have contributed virtually nothing to the warming since 1950 — the share of these factors was narrowed down by IPCC to ±0.1 degrees. “Forcings” is a key term in this literature, so you’ll see it a lot. The meaning is simple — something that forces a change. Greenhouse gases are a “forcing” — they force the air to retain heat. The sun is a forcing; it forces radiant energy into the climate system. The deforestation of the globe is a forcing; it reduces the CO2-absorbing effect of trees. And so on. What the above says is that the “forcing” effect of natural external factors (non-man-made) is ± 0.1°C. The rest of the roughly 1°C warming is us. They chart that here. Again, note that “zero” on this chart is much higher than the pre-Industrial norm — and that +4°C warming (+another 0.8°C warming for the shift in baseline from 1800 = roughly +5°C warming) measures just the middle of range for the “highest scenario.” As a worst case, that scenario still predicts that a worrisome +7°C is possible. As the report says, not much has changed in that regard. More on the scenarios later, as I analyze the new report. I’ll leave you to read the rest — there’s more on sea level rise, ice sheet degradation, and so on, in the Real Climate review. Scientists are conservative. They like to say things with certainty, or add the degree of uncertainty to their conclusions. And with climate, they’re always wrong to the slow side — things are happening faster than all predictions. That the IPCC often needs to correct itself “upward” is an illustration of the fact that it tends to produce very cautious and conservative statements, due to its consensus structure – the IPCC statements form a kind of lowest common denominator on which many researchers can agree. The New York Times has given some examples for the IPCC “bending over backward to be scientifically conservative”. Despite or perhaps even because of this conservatism, IPCC reports are extremely valuable – as long as one is aware of it. All you need to know — there’s an inherent conservative bias in the IPCC process, and it’s still a frightening report. Take out that conservative bias as you read it. Always consider, as I do, the worst-case predictions and you’ll be right more often than not. Not sure? Look at that sea ice chart again. Time to get moving, I think. Or better, time to get other people aware that it’s time to get moving. Because if we don’t force our carbon-addicted betters to act, it’s going to be a different world. They’re not going to stop being money-freaks on their own. This will take some pressure. You can help by teaching others that we need to act now. Zero New Carbon, that’s the ticket. At some point, climate awareness — climate panic — will reach critical mass. You can help. We want that panic, that need, to occur before it’s too late to stop the process. And who would actually believe or trust the UN… a group of rogue barbaric nations who have never accomplished anything of any value !!! “Maybe you could learn what those terms mean.” Then I could pass it on to you? Nah, you’ll have to look to your own instruction sweetie. Maybe you could learn what those terms mean. And get rid of the man made global warming worries that have kept you down in a liberal hole. You know technology and you don’t even remember the company is named “Tektronix”? Durr, I are a scientist and I’ve used Bekmun and Parkin-Ulmer instruments! Are you the slightest bit aware of the hilarious contradiction in saying that the media has tried to bury a story that can be found in a dozen media outlets (real ones, by the way, not Free Republic) within thirty seconds of Google searching? And why are you repeating yourself with this silly item anyway? It was stupid enough the first time. Awww, so cute! It’s like a Star Trek writer filling his script with scientific terms he picked at random out of an encyclopedia. Yet another article MSM and junk scientists have tried to bury. Guys, if its happening on Pluto and across the solar system, its happening here too. Sorry no SUVs or cow flatulence here. This is exactly the kind of thing I described in my comment below. I used Fox News in my prediction, but the Daily Holler is part of that incestuous collection of propagandists..
What grade would we give a science student for a predictive modeling of the climate if he did not figure out the lens effect and that the absorption radiation of carbon dioxide is logarithmic? I have designed a lot of electronics in WA and CA and always flew over OR. But in 91 we stopped in Bend and visited Techtronics where my wife knew a guy who was designing a time domain reflectometry instrument for fiber optic cable. Back then a spool of that cable was worth $10k, now it is dirt. What I meant was that there are pockets of primitive liberal people in Portland and Eugene, that still believe in the threat of man made global warming. Such beliefs spit in the face of science, as a sacrifice to the god of collectivism. DAILY SHOUTER??? Haw haw haw…. If you like the weather now, stick around. And in 2050, Arrgghh!!!! The polar caps are mostly solid carbon dioxide, which does not melt. Read what? A Free Republic link? Why even bother? Besides, I really really doubt that, despite all the reading you claim to have done, that you can pass a quiz on the characteristics of Pluto or any other planet. Havent even read it have you, doom n gloomer Same shoddy thoroughness as the ICCP…its not just Pluto. Hoo, boy. Oregon’s “primitive”? It’s the sci-fi futuristic paradise compared to some cesspool like Alabama. Well, I think your first three questions could be answered by reading the report, and Gaius’ earlier posts on the subject… but to touch on number four. Yes. All of the above. We should be diversifying our energy portfolio with not only more robust and simplistic ideas from the past, like wind turbines, but also more inventive ideas. The broader our energy base is, the greater chance we have at supplying our needs into the future. The more varied it is, the greater chance we have at not only preventing the current damaging energy monopolies and damage they are causing to the environment, but also of finding out what works best for different areas. To address the second part, we need somewhere in the range of a trillion dollars invested in our infrastructure immediately, just to bring it up to where it should be. Then, on top of that we should be building better breakwaters, better levees, looking for every possible way to protect everything we have from natural disasters, and leave no stone unturned. It isn’t a this or that proposition. It’s a do everything we can, and instead of half-assing like we’re so familiar with, do it right for a change. Of course, it’s a pipe dream when Congress can’t even manage to pick their nose without poking themselves in the eye. Thanks, but you’re making assertions that you could easily answer for yourself. Your question 1 for example. They have answered that question. Just read the report. If you’re truly intellectually curious (as opposed to simply making muddy-the-water statements), check it out and come back with the answers. They’re all there. Yeah, cos a planet–er, dwarf planet, sorry–with an orbital eccentricity of 0.25, an orbital inclination of 17 degrees, and an atmosphere with a lower pressure than you get from most single-stage vacuum pumps is going to work exactly the same as our own. Good God, is this the best straw you can clutch? Is it entirely religious? Sure, you’ve got the “God promised He wouldn’t flood the Earth again” types, but it seems like more so-called “sceptics” are motivated by a kind of “Red Scare” attitude that there’s an un-American conspiracy to destroy “the American way of life” for…I dunno, just because they’re evil I guess. 1. Just how was the 95% confidence level arrived at? An algorithm? A formula? A vote? Opinions? What’s behind it? Facts, please. 2. Everyone agrees that the past 15-17 years have not shown the warming predicted by the models. The models represented the best thinking of the climate consensus at the time. Why should we believe the models now? of these factors was narrowed down by IPCC to ±0.1 degrees.” That would seem to mean that natural variability could only cause cooling… is that a defensible position. 4. Last but perhaps most importantly, if we assume that climate scientists are correct and that a climate Armageddon is on the way, what would be the best way to deal with it? Should we only go for renewables? Solar panels? Windmills, that hot new technology of the 15th century? Or should we make our current environment more robust and flexible with breakwaters, massive subway flood doors, etc. Our futures depend on getting this right. “The time for debate is over” -Al Gore when attacking a masseuse. “The time for debate is over” – Barack Obama with a teleprompter on the left and the right. Another article MSM and junk scientists have tried to bury…. If its happening on Pluto and across the solar system, its happening here too. Sorry no SUVs or cow flatulence here. Absolutely Gaius but it’s not 135 million percent certain so the people who want to drill baby drill will hang onto any thread possible. Flimflam “scientists” put out nonsense that says the Earth is only 5000 years old and the rubes grasp it with glaring eyes and clenched fists. I have no doubt but that the Earth will survive. There is however a big question mark when it comes to humans. And a top Caltech scientist once said Vitamin C cured cancer. What’s your point? People like that don’t believe in science, period. To do so would violate their belief in the Bible as literally true, word for word. They have been conditioned to view everything as a belief system. For them it’s all a matter of us-against-them. Tucker Carlson is hilariously flawed. On your first point, the deniers look at a small section of the overall graph of time vs temperature and point to a short duration of time when temperature is relatively stable – saying things like “See, it’s not all that bad, it’s part of normal variation.” In reality, the complete time-vs-temp graph shows a big warming trend. On your second point, they’ll see one crackpot with a degree appear on Fox News supporting this assertion (much like “Doctor” Keith Ablow and his assertions regarding homosexuality), and the low-information people swallow it hook, line and sinker. The opinion of the degreed crackpot is held up as “evidence” that “the libtards” are flying off the handle and overreacting. They won’t believe it even when the time comes that there’ll be no polar ice and you’ll be able to cook a turkey simply by putting it outside in the sun. They’ll just crank up the air conditioner and plug their ears by singing “La-La-La, I can’t hear you” full-throat. I sat next to a woman from Wyoming and the subject of climate change arose and she said, “oh, you don’t believe that.” To believe that would have been inconvenient for the remaining 20 years of her life. I think we have two main problems: 1) ignorance, so many confuse climate with the weather and 2) a large population that is conditioned to propaganda manipulation.